The word Retrouvaille™ (pronounced re-tro-vi with a long i.) is a French word meaning rediscovery. 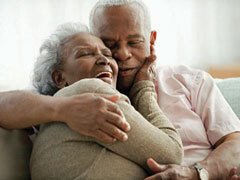 The programme offers tools needed to rediscover a loving marriage relationship. Thousands of married couples headed for cold, unloving relationships or divorce have successfully overcome their marriage problems by attending the programme. It provides the tools to help put your marriage in order again as well showing God's mercy in the healing and forgiveness that can take place in a marriage. The main emphasis of the programme is on communication in marriage between husband and wife. It will give you the opportunity to rediscover each other and examine your lives together in a new and positive way. "Just discovering that others have shared our road of pain and made it through gave us courage. Retrouvaille has helped me to save the most valuable thing in my life." The weekend is not a 'miracle cure', therefore, post-weekend sessions have been designed to continue the marriage renewal begun on the weekend. These follow-ups review earlier concepts in greater depth, present new ones and help you apply these concepts to your own marriage. The post-weekend phase is as crucial, maybe more critical, to the healing of marriage problems with in-depth reviews of many concepts and stages, including family of origin, early independence and marriage. "I was apprehensive and nervous before I arrived, not sure what to expect or what was expected of us. Over the weekend as we listened to the stories of the presenting couples we felt encouraged by their honesty and openness. They had been in the same mess as us, maybe even worse." Some couples come to Retrouvaille during the initial signs of marriage problems. Other couples are in a state of despair and hopelessness when they attend the programme. These latter couples often consider the Retrouvaille programme their final option. Many lawyers send couples to Retrouvaille before filing for a divorce or rendering final decisions. Many marriage counsellors also refer their clients to Retrouvaille. These professionals know that the tools of communication in marriage taught in the programme are often what couples need. "I attended Retrouvaille hoping that my spouse would see the light. She did see the light, but I was blinded by it. Retrouvaille has really illuminated our marriage." Retrouvaille is a faith-based peer ministry that has been recognized as a private association of the Catholic Church and subscribes to the doctrines of the Roman Catholic Church. Retrouvaille is designed for and specialises in working with couples married in accordance with the matrimonial rites of the Roman Catholic Church. It also provides support for marriages recognisable as presumptively valid matrimonial contracts under the Canon Law of the Roman Catholic Church and who are prepared to accept the Roman Catholic understanding of the matrimonial covenant. The program is offered on scheduled residential weekends beginning Friday evening, and ending Sunday afternoon at approximately 4pm. The post-weekend sessions take place over the weeks following the weekend, on four Sundays, starting at 9:30am and ending at 4pm approx. Thereafter, meetings are held once a month as a support group in various areas around the country. "We didn't have to share in small groups, nor did we have to bare our souls, or wash our dirty linen with the participants. This is not a weekend to change anyone but yourself." The cost per couple for the entire programme is €550. The cost of the weekend and follow-up sessions has been kept to a minimum and includes all meals, accommodation and all the materials you will need for the weekend. Also included are the materials for the four Post Weekend sessions, and tea and coffee. Retrouvaille is Catholic in origin. Couples of all faiths and those with no faith tradition are welcome and encouraged to attend for the benefit of their marriage. No attempt is made to convert anyone to a religion but we will ask that you respect our Catholic ethos. Retrouvaille is faithful to the Roman Catholic Church's teaching that marriage is a covenant that exists between one man and one woman. Any reference to marriage or couple made by Retrouvaille is in this context. "Over the weekend and in the weeks that followed a new sense of worth came into our lives. Retrouvaille put our marriage back on track in a way I never could have hoped for."